A 60-year-old female outpatient presented with intermittent atypical chest pain. 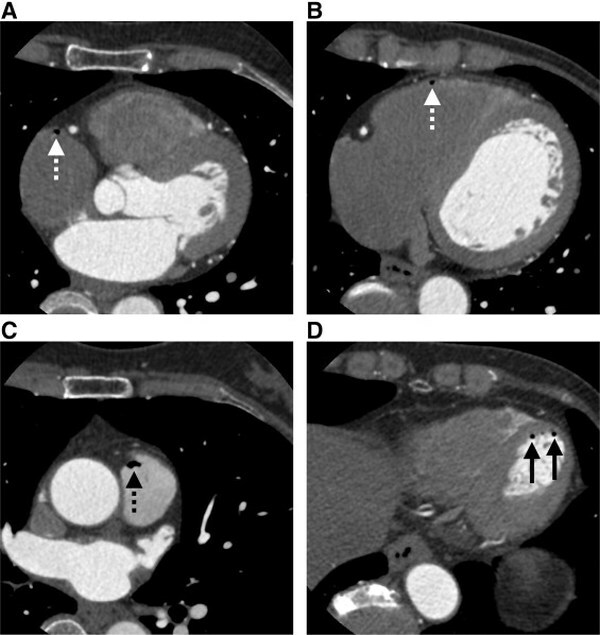 Coronary CT angiography was performed to evaluate coronary artery disease. A 20-gauge intravenous catheter was inserted into the right antecubital basilica vein. Nonionic contrast medium iohexol (300 mgI/mL) (Omnipaque, Daiichi-Sankyo Co, Ltd, Tokyo, Japan) was administered with a dual power injector (DSGX-V, Nemoto-Kyorindo Co, Ltd, Tokyo, Japan). The flow rate and total volume of the contrast medium were 4.9 mL/sec and 59 mL, respectively. After this, 25 mL of a 0.9% saline solution was injected at the same flow rate. The optimized scan delay time was determined by the test injection method. Coronary CT angiography was performed using a 64-row multislice CT scanner (Discovery CT750HD, GE Healthcare, Tokyo, Japan). The acquisition protocol included a gantry rotation time of 350 ms, a collimation width of 0.625 mm, a table feed speed of 18.3 mm/s, a tube voltage of 120 kV, and a current of 350 mA. An oral ß-blocker (50 mg of Atenolol; Tenormin, AstraZeneca, Osaka, Japan) was administered to reduce heart rate 1 hour before the examination; during the examination, her average heart rate was 57 beats per minute. The scan was performed while the patient held her breath after inspiration phase. There were no side effects following administration of the intravenous contrast medium. However, multiple air bubbles were identified in the right atrium, right ventricle, main pulmonary trunk, and left ventricle. 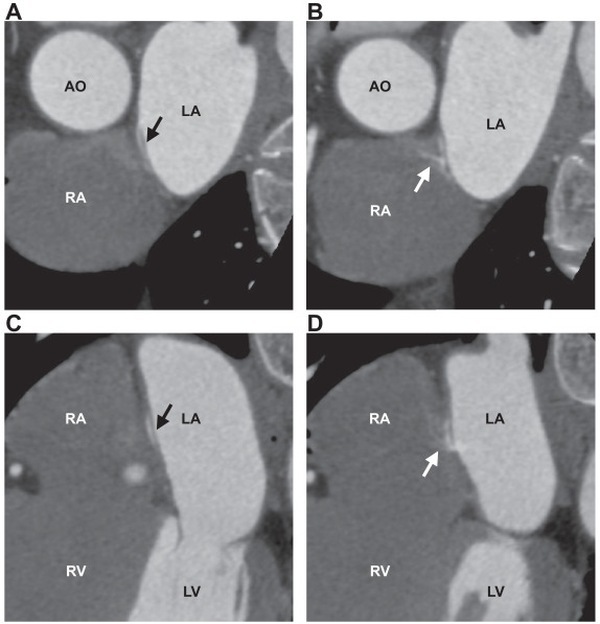 The presence of a patent foramen ovale was confirmed by coronary CT angiography. It took approximately 1 hour to reach final consensus about how to treat the patient and transfer her to an outpatient room; during the period, she was monitored with her spine position on the CT table. Then, she was monitored with her Trendelenburg position for another 3 hours. 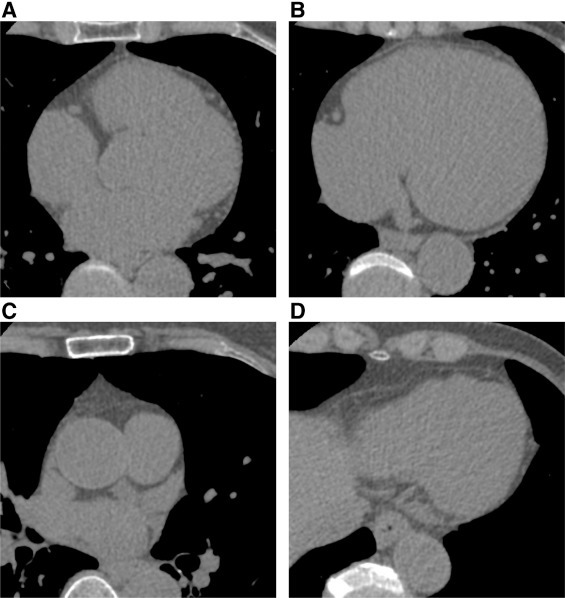 Subsequently, as we found no air bubbles in her heart on nonenhanced ECG-gated CT, chest CT did not show an intrapulmonary shunt such as a pulmonary arteriovenous fistula, and there were no clinical symptoms; she was discharged without special clinical treatment.